Consumer staples, one of the leading indicators I consistently look at to gauge the market, have been going up. Stocks like Costco (Nasdaq: COST), McCormick (NYSE: MKC) and Clorox (NYSE: CLX) have ripped to new all-time highs. The Sysco (NYSE: SYY) in the staples sector has even embarrassed Cisco (Nasdaq: CSCO) in technology. It’s been a nice run. The question, however, is if the strength in staples is evidence of a flight to safety (the common assumption) and whether we should be concerned about the overall market? It’s an important question to answer, and I want to walk you through my thought process. 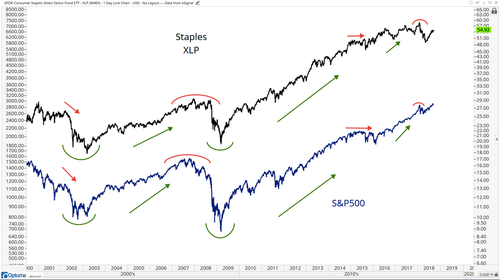 First of all, the mere fact that the price of consumer staples, tracked by the Consumer Staples ETF (NYSEArca: XLP) is going up is not, in and of itself, a bearish characteristic. The more relevant factor here is the relative performance of staples, rather than the absolute. By this, I mean let’s take a look at the S&P 500 (NYSEArca: SPY) as the numerator (remember that from high school math) and consumer staples as the denominator to better show the relative strength, or weakness in this case, of the staples. As stock market bulls, you’re rooting for staples to go up in price, just at a slower rate than the rest of the market. When staples outperform, you’re seeing evidence of a change in trend for U.S. stocks. This correlation has not always been the case, but you can’t argue that we’re not seeing that in today’s market environment with today’s weightings. Those have changed dramatically the past 30 years. So we’re concerned with today, not the correlations of the late 1970s and early 80s, just to be clear. 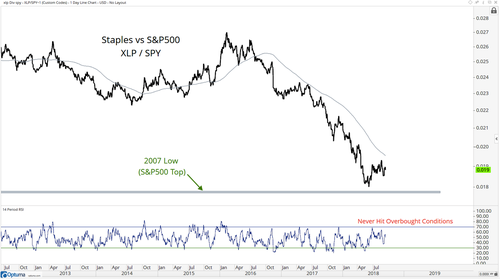 If we take a closer look at the longer-term chart of staples relative to the S&P 500, we’re now down to the 2007 lows, which took place a few months before the S&P 500 put in its epic top in 2007. You can see how this ratio exploded higher throughout 2008. 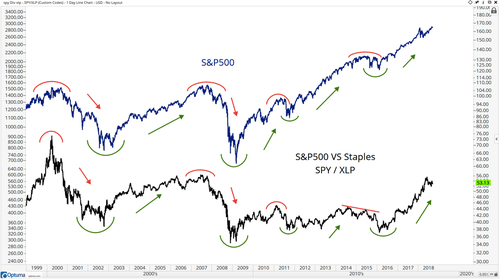 A similar divergence to what we saw in 2007 would be concerning — where S&Ps are making new highs, but the relative strength in staples is simultaneously turning up. So far, there’s no evidence of a major turn. In the chart above, you can see potential support in this ratio from back in 2006 to 2007. It bottomed close to where we are today, and the S&P 500 peaked. But remember, this is only potential support. 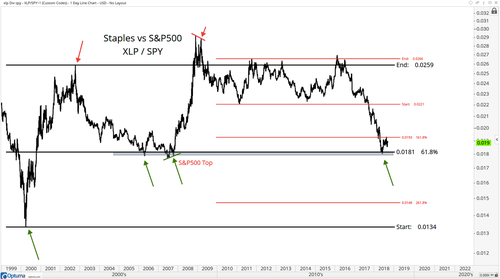 Taking a closer look, here is the ongoing downtrend in the XLP/SPY ratio. Price is making lower lows and lower highs below a downward sloping 200-day moving average — and momentum is in a bearish regime. There’s nothing in this chart to suggest we’re in an uptrend of any kind or that a significant turn is taking place. This meets all of our characteristics for a downtrend. Could this 2007 low end up turning as support? Yes. Absolutely. But there’s no evidence whatsoever that it has. I think this is a big chart we want to be watching. It’s served as a good signal before. I would combine this with many of the other things we’re watching — breadth, sector rotation and key price levels (most importantly) — to determine if we want to err on the side of buying stocks or err on the side of selling them. Right now, we’re buying them in my Breakout Profits service. There’s no one golden signal or tool when it comes to being bullish or bearish. I go by the method that’s important to weight all the evidence and make a sound decision, instead of basing moves on incomplete information. We’re just here trying to do the best we can. I think the XLP/SPY chart helps us do that.